McMahon Five Designs release today includes this fun digi that reminds me of my older sister Eileen. So, the image can be found in the store HERE: Bright Eyes JPG and PNG . I added just a light touch of color to her face and cheeks with Copics . She is adorned in jewels. She looks like she would be ready for tea with the Queen! The Bloggers Challenge for this week is a color challenge- Black and White/Vanilla plus one other color. The Bloggers challenge 'Mom' is Lisa- you can find her blog HERE. Just add your project to the Linky below to join in the challenge. She's absolutely gorgeous! Love this image and your pop of color really makes her stand out. This is so pretty Shelly! Love the way you framed out the beautiful image too. My mom had dark hair like that and it reminds me so much of her. Beautiful card Shelly! You really made the gorgeous image pop with the die cut. How fun! Love all the sparkle! Love your sweet girl Shelly!!! So adorable!!! How pretty! Wonderful design, love the added gems! Wonderful card. I love the vintage image and the added sparkle. Nice one Shelly - love the simplicity of the card - it really complements the image. Wow.. 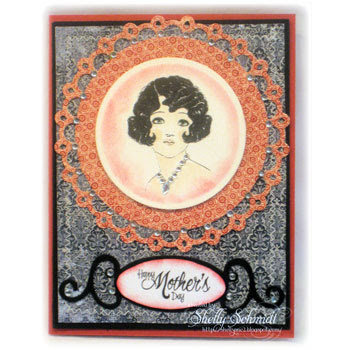 I like this image and how you've made it the focal point of your card. Really, really nice... so vintage and chic!